Plush seating is combined with soft contemporary styling that creates the bold look of the Chai Collection. The two-tone brown fabric lends to placement in a number of decorative environments. Manual motion mechanism operate with a pull of a side-mounted tab, that once engaged, take you from seated to reclined in an easy motion. The chair fully reclines and features a glider mechanism for the ultimate relaxation experience. 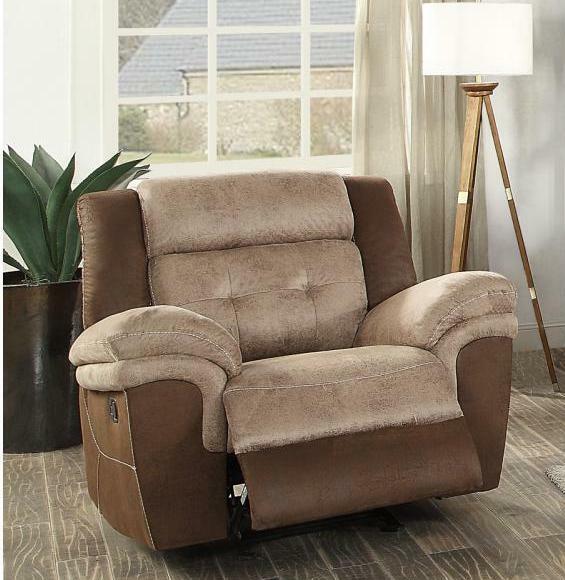 FEATURES: Brown / Dark Brown Color ~ Contemporary Style ~ Manual Recliner ~ Plush Seating ~ Polished Microfiber Cover ~ Stitched Lines / Button Tufting Accents.